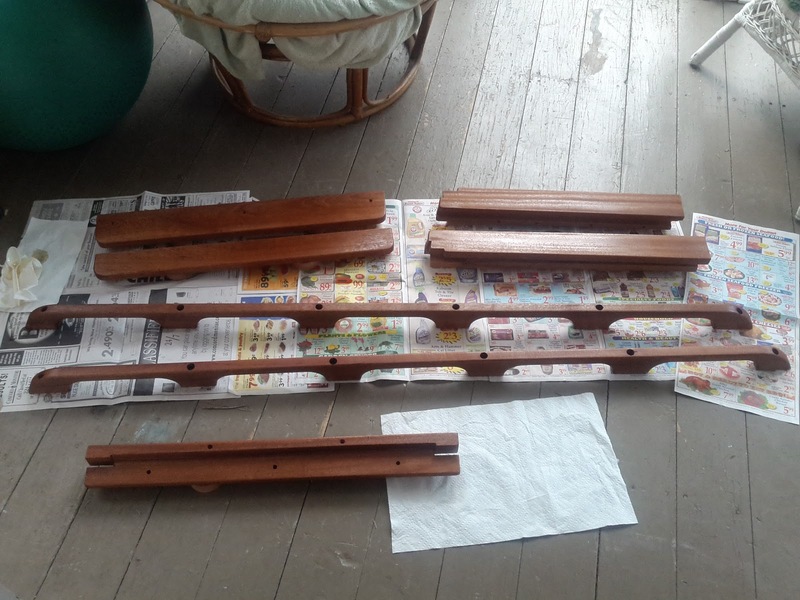 I haven't had much time this past week, but the temperature is beginning to cooperate a little bit more so I was able to start practicing my very rusty varnishing skills on our sun porch. I'm using Epifanes Wood Finish Gloss for the first few coats because it allows no sanding between applications. I'm probably going to do 3 coats before I mount these pieces and then do the rest of the coats in place once I plug the screw/bolt holes. I was just anxious to see something look nice and varnish-y for a change. Of course after 1 coat there is virtually no gloss because I thinned to 50% so the wood would get a good soaking prior to beginning to build. I'll do 25% thinner for the next few coats and see how that works and then I'll play it by ear. The final 2 coats I'll use Epifanes Clear Varnish (the standard varnish) because I'm told it's a bit harder for protection. 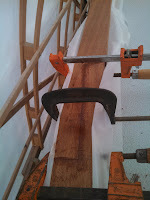 I also glued up 2 of the 4 scarfs in the cap rails with a mixture of epoxy and wood dust. I've been carefully saving all the fine dust from some of my cutting operations so I would have a filler that matched the wood. At some point this week, I'll get the other 2 glued up and hopefully make some more progress on the cap rail installation this weekend. I'm still haven't fully decided my approach (see "I Haven't Screwed up the Caprail Yet!" post for more details). April is usually a really nice time of year to get boat things done, but this year has proven to be a cold spring. I woke up Saturday morning to 19 degrees F with the wind gusting to 30. Not really conducive to working outside and certainly no good for epoxying scarf joints. I had planned on going to Ragged for some spring skiing but a friend on ski patrol called and told me that the skiing was definitely not spring like. So it ended up being a bit of a wasted weekend on all fronts, but I did manage to get a few things done on Sunday. Raw hatch fitted. Not pretty yet, but functional. 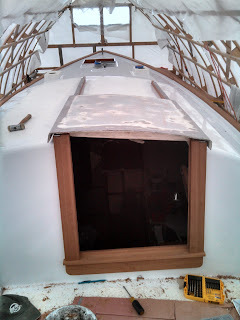 I spent more time than I had wanted getting the grabrails drilled and fitted; the bolt pattern was not even and because I wanted to use the original holes in the cabin liner (and the interior grabrails), I had to carefully measure and tap each hole and double check for proper fit. Some were spaced 12", some 11", some 11.5", couldn't the builders have been a little more careful? In any event, I got the job done but forgot my camera. I still need to order 12 - 1/4" x 5" bolts, nuts, and washers to completely finish the job (The original bolts are serviceable, but a bit beat up, so I'm replacing). Once complete, I'll bed the whole thing down with butyl tape that I ordered from Compass Marine. I also worked on fully mounting the aluminum slide track and fitting the companionway hatch. 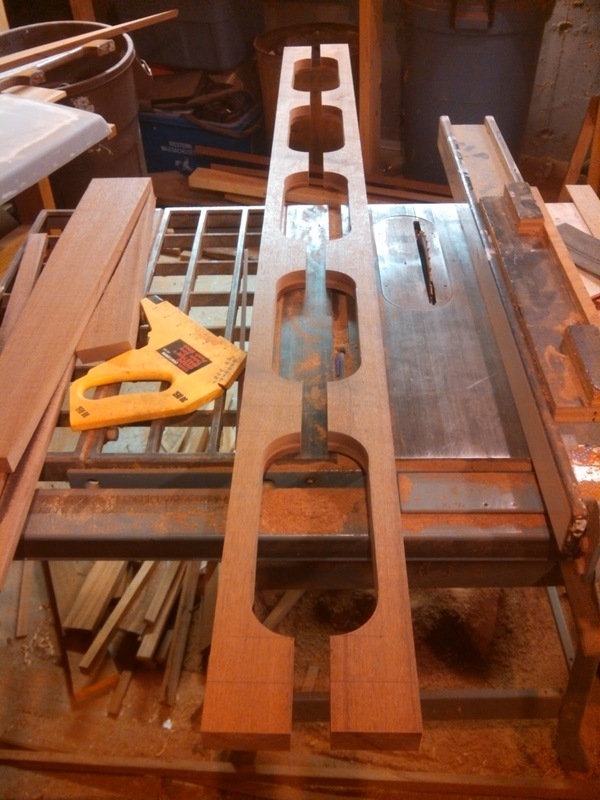 This proved to be a bit tricky because the track on the hatch doesn't allow for much tolerance; 1/16" off in either direction and the hatch will either bind or derail. Mounting the hatch itself proved to be a bit of a puzzle as well. Because of glassed-in stops on the hatch itself, you can't simply slide it onto one end of the track. I finally figured out that you have to actually un-mount one of the aluminum slides, get the hatch on the other side, and then slip the unmounted track into the hatch track before screwing down. Difficult to explain but I managed to get it done without too many choice words that I'm not supposed to say in front of the kids. 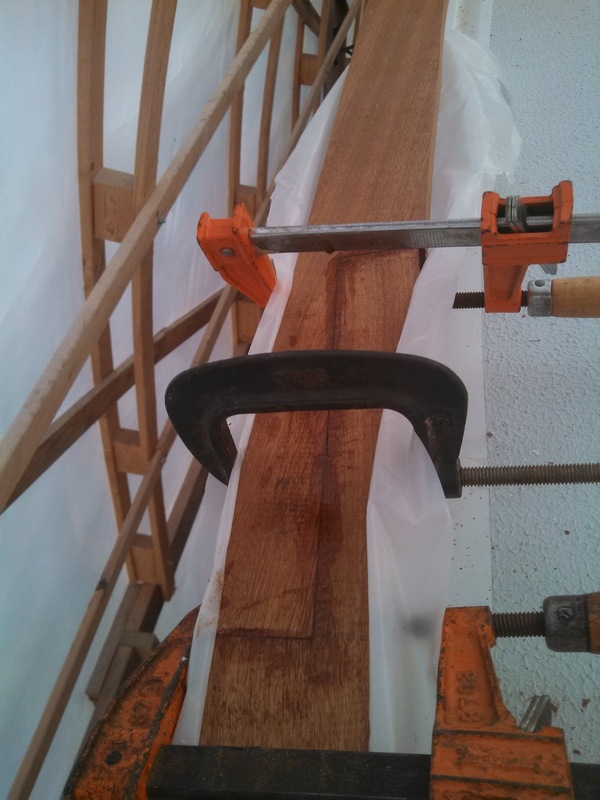 I'm not sure if the old cabintop grabrails were original or not, but they were so thin from being sanded so many times that they probably weren't safe and just weren't going to cut it. They were also pretty badly bleached and stained from so many years in the sun that they looked pretty ugly. 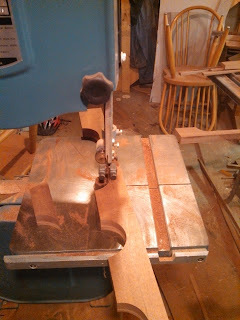 So I went to Goosebay Lumber earlier this week and picked out a nice 5/4 x 6" piece of Sapele to make a new set of them. 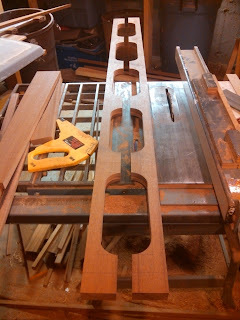 I know there are many ways to make grabrails and by staggering the rails on the single board I could have cut down on the waste, but it's a lot more work to do it that way so I chose to make them by opposing each rail on the board so I could cut each of the six the bases of both rails with one cut from the hole saw. 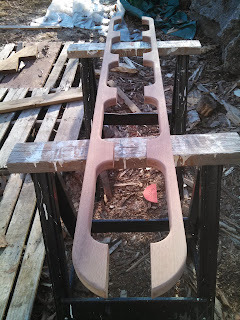 I started by laying out the old rails to mark the base positions on the piece of Sapele. I never noticed before, but the old rails were not the same size. One was about 3/4 inch longer than the other and the bases didn't quite line up. Dammit, can't anything be easy? 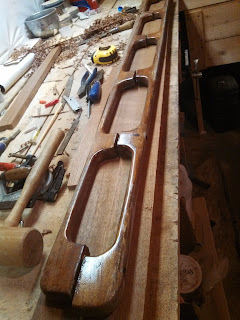 So I took the rails back over to the boat and found that although they weren't the same size, they were bolted to the cabintop with the same 12 inch on center pattern (there are matching grabrails on the inside of the cabin that they afix to). 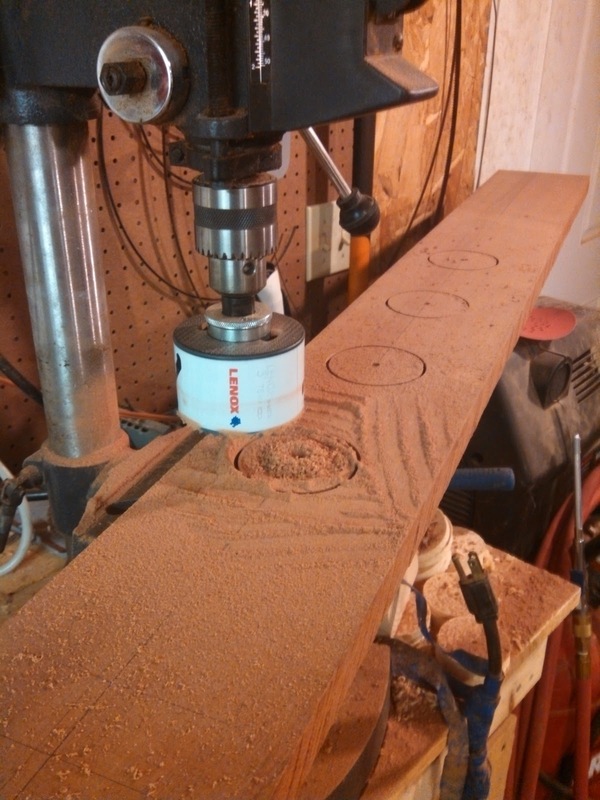 So using 12 inch on center as the known center for the bases of the new rails, I carefully layed out the dimensions and marked the radius centers to cut. Using a 3 inch hole saw, I cut each hole about 3/4 of the way through the board, making sure the center drill penetrated the entire board so I could use that as a guide on the other side. Then I flipped the board over and finished each hole cut. Next I set the tablesaw fence to 2-7/16 inches to account for the 1/8 inch blade kerf on the tablesaw and ripped the board down the middle. Now I had two pieces that were rapidly starting to look like grabrails. 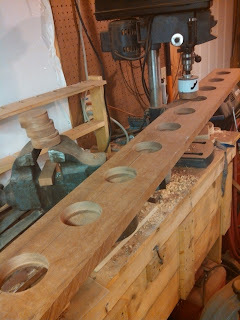 I moved onto the band saw and cut out the waste wood between each of the holes. 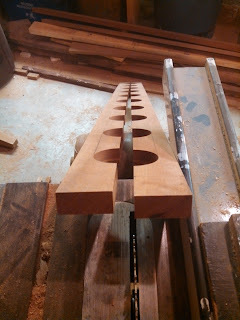 I initially tried using the bandsaw fence so the cut would go straight, but it seemed to bind things up a bit so I removed the fence and just cut it freehand along the line I had previously drawn that connected each hole. I've found that as long as I have a line to follow on the band saw and the radius isn't too tight, I can make cuts with it that are almost perfectly straight. 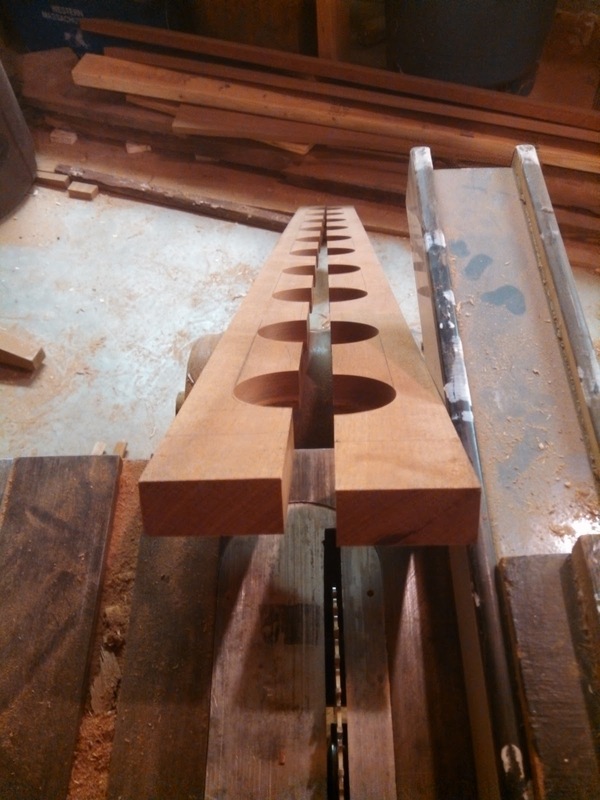 I put a rough 5 inch radius curve on either end of each with the band saw. Once that was complete the two rails needed to be cleaned up a bit with my Shinto rasp and then the finer standard wood rasp. 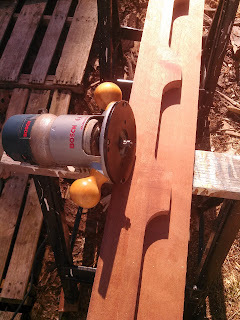 After I was satisfied that everything was reasonably fair, I moved the boards outside and set them up on sawhorses and busted out the router with the round over bit. 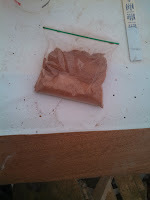 Then it was just a matter of carefully following all the edges and smoothing everything out. I finished up by going over both grabrails with 150 grit paper. 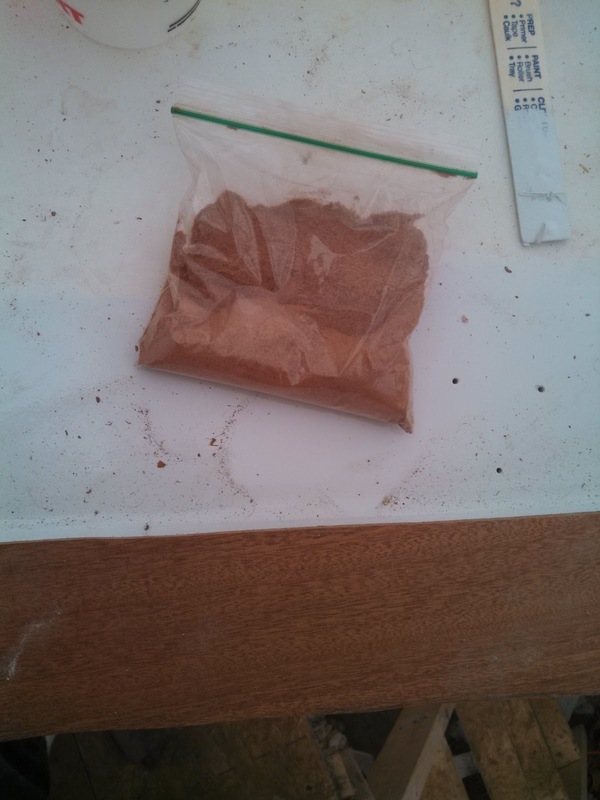 I'll follow up with 220 grit once I'm ready to varnish. This weekend I'll tap out the holes for the bolts and get them dry fitted on the boat. I will probably have to bevel the base edges to account for the deck camber. Once I get the proper angle I'll just run them through the table saw and that should take care of it. I think they turned out looking really good. I like the larger base width and the overall size of them is a bit beefier and will feel more sturdy. I can't wait to get a few coats of varnish on them, they will be stunning.